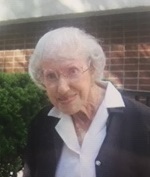 Obituary for Madeline Reilly | Seamon-Wilsey Funeral Home, Inc.
Manhattan.... Madeline Reilly, 95, of 49E 7ies3rd St. died Wednesday at the Ferncliff Nursing Home. Born September 9, 1923 in New York City. She was employed for many years in the James Lennox House in NYC. Survivors include a Daughter, Patricia Reilly of Saugerties, NY. Her Graveside service will be held 11:30 AM Monday, April 1, 2019 at St. Charles Cemetery, Farmingdale, Long Island. Arrangements are under the direction of the Seamon-Wilsey Funeral Home, Inc., Corner of John & Lafayette Sts. Saugerties.